so, i posted an influence map in 2010, but i've since felt the need to update it. i wanted to reference more specific pieces that inspired me as well as create a better idea of how my style came to be. i often get asked how i found my style, what my inspirations are and what my style is called (i have no idea - does anyone know??). i'm hoping this will help answer those questions! 1. rose besch / bara-chan - her work influenced me a lot when i was drawing intensively at the age of 17 and 18.
main influences: her approach to proportions and creating dynamic illustrations full of life and personality. 2. Jana Schirmer / janaschi: i've been following her work since she was generally known as the 14-year-old oekaki prodigy back in 2003. her work still inspires me enormously. main influences: the thick, painterly coloring style + overall style of drawing characters. 3. lostfish: when i discovered her art, she was known as "rusty" on an oekaki board called 'oekaki circle'. her style has evolved enormously since then. main influences: she drew a lot of fish in her art, as well as adding gothic/punky touches to the characters she drew, inspiring me to do the same. 4. klar : a fantastic artist who drew a lot of neat anthro characters when i discovered her work as a teenager. it always made me think of contemporary takes on 70's illustrations. main influences: the proportions, 'chunky' aesthetic and faded brown colors/textures. 5. saka a.k.a sukinahito - i've been following her artwork since 2002, so it really inspired my early artwork. 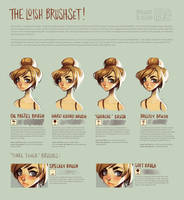 main influences: the thick painting style, especially for the facial features and skin tones. the highlights on the faces she draws. 6. Paul Davey / mattahan - i discovered his work in college and was captivated by the poetic atmosphere he creates in his work. main influences: the piece pictured above inspired a whole phase of ribbon-y artwork for me. 7. Eric Fortune: discovering his work also contributed to a surreal ribbony-phase. main influences: the surreal, dream-like atmosphere and flowing forms. 8. Hyung Tae-Kim: his work made me want to completely change my painting style. before discovering it, i used relatively flat coloring techniques. main influences: the creamy skintones, pronounced highlights and painterly feel. 9. Norman Rockwell: what's not to love about this fantastic artist? main influences: the limited palette, skin tones and style of drawing faces in profile view. 6. Gil Elvgren + pinup art: definitely an inspiration for almost all of my artwork. main influences: the flirty attitude and pinup format in general, as well as the painted style that Gil Elvgren has in his work. main influences: the style of designing surreal, futuristic costumes and feminine, art nouveau-like style. 12. zain7: this is what i aspire to be able to convey someday in my environment drawings. main influences: the approach to color, the detail in the environments. 13. 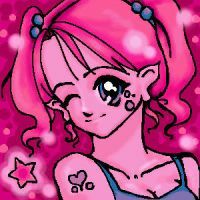 Aurore Demilly / auroreblackcat: her work was my number one inspiration from 2003-2004. i loved her mix of manga + french comic style and the sweetness of her female characters. main influences: her overall drawing style, especially how she drew faces. 14. YiLee: a korean concept artist whose work i've been following since 2004.
main influences: the textured look of his painting style, the colors (earthy shades with bright reds and blues), the overall sense of style. 15. MichaelShapcott: the decorative elements in his work and melancholic feel really inspired me when i discovered his work in college. main influences: the colors, textures and circular decorative elements. 16. Benjamin Zhang Bin: i discovered his comics through a friend of mine in 2005. the style is striking and very unique. main influences: the approach to color, the painterly style, and warm lighting. 17. disney / the little mermaid - an obvious one for people who have been following my work since 2003 or so. i still have all my disney fanart up at disney.loish.net for those who are interested! main influences: the flowy, cartoony style and the exaggerated girlyness. 18. Koji Morimoto: His use of contrasting colors, especially blue and red, and the gritty, dystopian style really appealed to me when i discovered it in the 'animatrix' in 2004.
main influences: bright colors, cool shapes, edgy punky style. main influences: the creepy but beautiful appearance of the sea creatures and the floaty, dreamy atmosphere of underwater settings, as well as the colors. 20. retro colors: i've always been drawn to color combinations that have a 60's feel, or anything that feels old and faded, because of the nostalgic feeling it creates. the record player is a print by artist Jack Hughes. main influences: palette and design elements. 21. Francisco Perez / pacman23: he posted a coloring tutorial in 2004 when i was trying to develop a painting style with more depth. this was the first time it had ever occurred to me that i could layer lighter colors over a darker base layer, which has become a really crucial defining element of how i paint now! main influences: approach to shadows and creating depth. 22. Alfonse Mucha: my number one inspiration, from when i started drawing more in 2001 to now. main influences: everything - the overall style, the compositions, poses, color schemes, approach to detail, etc. 23. James Jean: i researched his work for my master's thesis in 2009 and it had a pretty big impact on my artwork at that time. main influences: the surreal style, striking colors and flowing forms. 24. Gustav Klimt: art nouveau in general is a huge inspiration to me but klimt is one of my particular favorites. main influences: the soft, impressionistic painting style combined with bright decorative circles + shapes, as well as the earthy colors. 25. Les Triplettes de Belleville: seeing this movie triggered me to draw in more earthy tones, and step away from only bright candy colors for a while. main influences: the textured, faded feel. 26. Wallpaper patterns: i used these quite intensively for a long time. main influences: the overall look of 70's and damask wallpaper patterns as background elements in my work. 27. J.C Leyendecker: another great painter that never ceases to inspire. i especially love his saturday evening post covers. main influences: thick, painterly brushstroke and skintones. the overall 'creamy' look. 28. Cityscapes and urban settings: this type of imagery has always inspired me, especially the combination of something run-down and sad, but still beautiful and tranquil somehow. i was born and spent the first four years of my life living in an apartment block so i guess this is a form of nostalgia for me. main influences: the faded colors and gritty feeling. 29. beautiful and fashionable girls on the internet: the list wouldn't be complete without this! the girls pictured are Kaylah from The Dainty Squid and Otiliah from ourbungalow.tumblr.com, but there are of course many more awesome ladies whose blogs i follow on tumblr. main influences: their unique style and beauty! Oh, I LOVE this! ... Now I want to make one of my own. Is that cool? oh my gosh, tripplets of belleville!! When I saw that film the first time I was probably too young, but I enjoyed it thoroughly, especially the art style!! Now it's just one of those great films that give me inspiration! yeah i guess that makes sense! some folks have called it 'semi-realism' in the past too which i guess makes sense? cartoony proportions with a more realism-inspired painting style..? You would love the book of Mucha's great works and life then, a very good read with some of his best pieces! Beyond what I've remarked upon before, it's good to see recognition of Norman Rockwell. Aw <3 I feel honored Many of these inspired me as well! Its great to see your work progressing, keep it up! Do you know Xavier houssin?? my God your work is flawless!! this is so beautiful and sincere. Very neat and interesting! I'm very fond of Mucha and Klimt too, and Les Triplettes de Belleville is an awesome movie! I love this, and it's a great idea! the triplettes of belleville!!! an amazing movie. one of my faves. I love seeing these from amazing artists! Creo que te estás volviendo loca! What a delightful pathway to you! And wow, we have a lot of the same influences. Have a couple more artist to check out now thanks. thank you for sharing! this is really insightful. Moment I picked up a book about J.C Leyendecker's work, I never forget that name nor his art. Thank you for sharing! It's amazing to see how these artists have inspired so many people to create different things, and with this you have created your own style and inspired many others. This is fascinating. It's fascinating to see how as our art develops, our interests do, and the artists that influence us do as well.